Most corporate videos are mediocre and forgettable, but on occasion we come across ones that rise above the clichés and grip us to the end. Here, Jason Sumner provides a round-up of some of the best videos on the corporate web, and two that stand out for all the wrong reasons. Imaginative. Memorable. Watchable. These are words not usually associated with corporate videos. That is why it is a surprise and a delight (for those of us who spend our days evaluating the quality of online corporate communications) to find corporate videos that are genuinely engaging. The best corporate videos also have what we call editorial impact – putting across a key strategic message – whether it’s about innovation, nurturing employees or the company’s commitment to the environment. Here are seven of the best online corporate videos that our consultants have seen recently, and two that are firmly in the ‘what not to do’ category. Currently available on the Danish energy company’s global home page, the 3-minute video has a clear purpose – to introduce the company’s name change and new business strategy, which focuses on renewables. It is also moving at times (for this viewer at least) – a rarity for corporate videos. Filmed from a unique perspective, this imaginative video strongly puts across the message that IBM is at the forefront of innovation, and is a commercial for IBM’s artificial intelligence product, ‘Watson’. The absence of narration across just over a minute of video works well when the ‘AI point of view’ is so well realised. Nabors is an US-based oil services company that has a range of global office-based positions, as well as a number of jobs on its fleet of land-based drilling rigs. In the corporate world, employee profile videos rarely venture outside the office environment, which makes this 2-minute video so refreshing. Dave is remarkably open about the benefits and drawbacks of life on a rig, but ultimately concludes – ‘I could never see myself doing an office job now’. It provides authentic insight for people considering the same work. Dave also manages to include an endorsement of Nabors’ commitment to employee safety. A clever and fun take on ‘The Newlywed Game’, where couples who also work together at the US-base pharmaceutical giant talk about their ‘worst date’, ‘best trait’, ‘irritating habit’ etc. The tone shifts halfway through, with the couples discussing why Lilly is a great employer. An oldie which we have written about before, but still a goodie. The luxury goods maker invites users to ‘take a glimpse at the daily lives of our employees’ with short, fly-on-the-wall films following a range of activities across the company’s brands. They range from a press team meeting at Paris department store Le Bon Marché to a morning briefing at cosmetics brand Sephora in New York. A 5-minute YouTube film that has been signposted from the British American Tobacco site for some time, but which is not any less memorable for that. It is the only corporate video that we know of with a murder in it. (And a bomb going off, and an age-appropriate warning). PBS, a public television network, is loved and hated in the US, but it is tapping into the love for fundraising. These short films (scroll down the page for the videos) come from outside the conventional corporate world but are worth looking at for ideas about subject matter and keeping to a consistent theme. 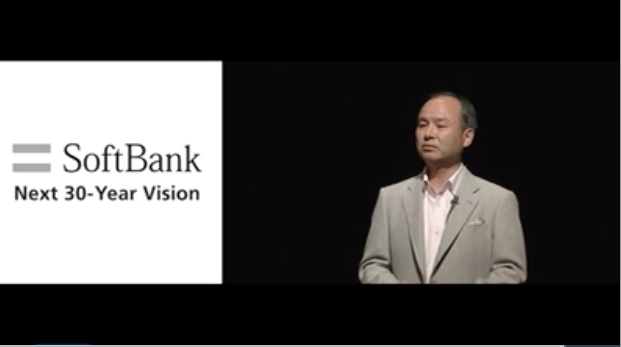 Two of the worst corporate videos we’ve recently seen come from Danaher, the US-based industrial equipment and healthcare conglomerate, and Softbank, the Japanese telecoms giant. At first this 3-minute video (scroll down the page) appears to be a fairly conventional (and mediocre) effort. However, if you watch it all the way through (which we do not recommend) it takes all of the weaknesses of conventional company films to new lows. It is full of visual and editorial clichés: ‘Our shared purpose is in everything we are, and everything we do’; ‘It’s why we view every challenge as an opportunity’. It also lapses into jargon – ‘(our shared purpose) is operationalised through DBS’; and over-statement – ‘For us, (our shared purpose) is our greatest reason for being’. This 2 hours plus film must be seen to be believed, and we confess to only having watched parts of it. Technically this is a webcast, not a film, but it continues to be promoted on the company’s online ‘Vision' pages, despite being 9 years old. Although there may be cultural differences at work, to Western eyes it is odd, rambling and offputtingly long. Facebook’s corporate online newsroom has shown an unusual willingness to tell the world what the company is doing to fight fake news and Russian trolls. Too bad the messages do not necessarily match the reality, says Jason Sumner. Spend an hour browsing Facebook’s corporate online newsroom, and even the most ardent Facebook sceptic could experience a wobble. ‘News’ promotes positive features but currently shows Facebook mostly in defence mode, and you can trace the history of recent scandals by some of the links: ‘Response to Six4Three Documents’; ‘Elliot Schrage on Definers’; ‘New York Times Update’ (in and amongst more fluffy titles, ‘A New Way to Share Gift Ideas on Facebook’). ‘Inside Feed’ is Facebook’s attempt to let us peer behind the curtain. ‘With Inside Feed, we aim to shed more light on the people and processes behind our products’. And the section is effective at doing this, with well-made videos showing real employees doing real things to ‘make advertising transparent’, fight child exploitation on the network, hunt false news (‘both those we caught, and some we caught too late’), etc. One video, ‘Facing facts’, is particularly persuasive. ‘Hard Questions’ is a forum for Facebook, and external contributors, to explain the company’s approach and thinking about controversial subjects, such as ‘Who Reviews Objectionable Content on Facebook – And Is the Company Doing Enough to Support Them?’ or ‘How Does Facebook Investigate Cyber Threats and Information Operations?’ The section appears to steer away from specific controversies, leaving that for ‘News’. We praised ‘Hard Questions’ in a BC tip, for allowing and responding to criticism in comments below these pieces. The articles and videos are full of facts, to their credit. An article published in November by Facebook’s head of cybersecurity policy said the company, in the previous week, had removed ‘36 Facebook accounts, 6 pages and 99 Instagram accounts’. Another article by the vice president of product management said that in ‘Q3 2018, we took action on 15.4m pieces of violent and graphic content… more than 10 times the amount we took action on in Q4 2017’; they also took down 800 million fake accounts in Q2 and 754 million in Q3. Even if you disagree with some of the above, or all of it, it is hard to come away from the site arguing that Facebook is ignoring its problems. It is unconventional, unusually open and thoughtful, acknowledges criticism and does not try to shift blame. For those reasons, it is a largely successful piece of online digital communications. The problem is that anyone who has been on the internet or near a newspaper recently will know that what the company is saying in its online newsroom does not necessarily reflect what was happening behind the scenes. Facebook’s travails show that it doesn’t matter how sophisticated the online communications are, when the message does not reflect reality, companies are going to be caught out. I don’t have many conversations with chatbots on corporate websites yet, but I’m certainly talking a lot about them at the moment. Digital corporate communicators, perhaps having just seen a shiny pitch from a software company, are asking us – do they actually work? Is anyone else using them? Should we believe the hype? Actual chatbots in use on corporate websites are few and far between. They are so unusual, and there is so much interest, that we try to write about them when we see one. Enel, the Italy-based power company, has a Facebook Messenger news bot on its corporate site, as we noted in this recent piece. It is called ‘Elen’ and helps visitors find news, press releases and stories, and introduces the company’s sustainability activities. The bot shows some promise, but those wanting detailed information are better off sticking with the corporate website. Tying the bot to Facebook Messenger could be risky too, since not all corporate website users will have it installed. Enel may just be following the path of least resistance, however, by relying on Facebook Messenger, which had 33,000 active chatbots as of January 2018, according to IBM. We’ve seen other examples, focused on careers: T-Systems, a Deutsche Telekom subsidiary, has a German-language bot called ‘KATY’ on its website careers section. UPS, the US logistics company, has one on its careers site, as does US telecoms giant Verizon. These three are not very helpful and a little cold (the Verizon one keeps answering questions by referring people to the careers website, but at least it does that much); they do not perform nearly as well as a good online FAQ, for example. They work best in a limited context, so the possible range of questions and answers are contained; in corporate communications terms, this means interacting with a specific set of stakeholders with easily predicted queries (hence the focus on jobseekers) or telling customers where a petrol station is; rather than an all-purpose ‘ask me anything’ bot. If chatbots become more widespread, the technology will raise new reputation risks. Companies, for example, will need guidelines for appropriate tone of voice, race and gender. Finally, no one we have spoken to has launched a chatbot, yet. But there are some interesting things happening internally – eg, one has launched chatbots for employees, with a view to rolling them out externally when the technology is proven. The theme of our annual conference on June 18th and 19th 2019 in Berlin will be ‘Online communications, tomorrow and today’. We’ll be doing many more pieces on the future of online communications in the next weeks and months. The Bowen Craggs Club recently had a wide-ranging conversation about our members’ biggest challenges when it comes to content and channel strategies. While the proceedings are confidential, Jason Sumner shares three of the common problems that came up, as well as some of our advice, present and past. The corporate website is too often a battleground of internal politics. Senior managers may demand that their material is given undue prominence, while others fear the risks involved in publishing compelling material. The answer to this one is for the digital team to have influence and decision-making power – easier said than done, of course. However, some do achieve this. The most successful digital teams among our clients are those whose senior executives trust them to make the right choices on the web and give them the freedom to decide. You and your digital team may be in that fortunate position, or more likely, you are not (or somewhere in between), having to go through rounds of approval, watering down a once-compelling story or being hopelessly late in fostering an online response to a fast-moving communications crisis. There are ways to build influence and trust, and they come down to ‘proving one’s worth’ or in a word, ‘measurement’. The metrics and evidence that persuade bosses will be different for each organization but there are similar themes across the companies we work with. The evidence being compiled must refer back to the organization’s goals (or perhaps just the goals of the executive you are trying to convince – hopefully they intersect). Many executives, being focused on the bottom line, love numbers, and especially ones that say the website is important to customers. Meaningful visitor data and analytics are often the key, showing where customers go on the site and their opinion of the brand and company after their visit – number of leads generated, for example. Numbers are not everything, and well-chosen anecdotal evidence about a few big sales that started as leads from the website can be just as powerful. So in addition to all the other skills, the digital manager needs, as they say at my daughter’s nursery, ‘listening ears’ for these kinds of compelling internal stories. For more, see ‘The right personality to run a global web estate’ on our website. See the ‘listening ears’ point above – it is sometimes about being in the right place in the right time to overhear an employee’s weekend feats that could turn into a good story for the website. Processes and structures for sourcing good stories are important, such as brainstorming forums and well-publicised ways for employees to send tips. The digital team at SABMiller, before it was swallowed up by AB InBev, used to have an editorial board with dotted lines across the organization. At our Web Effectiveness Conference last year, Tim Clark of SAP explained how he finds and nurtures gifted writers inside his organization for the production of articles on the company’s presence on Forbes.com, as well as on the company’s own online channels. Tim also urged delegates to focus on publishing articles that are genuinely interesting – even if their relevance to company activities are tangential – rather than falling back on marketing puff pieces, which never fail to fail on Forbes.com. Also at the conference, Scott Roane of Aegon said he takes an informal, personal approach, contacting potential authors directly, offering encouragement and constructive feedback. With a streamlined approval process, he can sometimes get stories on the web in a matter of hours, which also helps to motivate contributors. For more on stories, see ‘The joy of words’ on our website. The concept of the ‘corporate centre’ is common in most large organizations, but there is no common approach, or even definition of ‘local’. Some organizations have autonomous country managers, others are highly centralised; some markets take a higher priority; in others, they are equal. This diversity is reflected in the needs for local-presence websites, so there is no single model for success. However, the most effective organizations find the right mix for them between incentivising regional editors with training and support and saying ‘no’ to new microsites or inappropriate material. Our ideal is the ‘loose-tight’ model: light central governance and support, with engaged senior managers and well-trained web managers. Again, how this ‘ideal’ plays out will be different for each company. The way forward we advise is to identify some companies who are doing it well, see which governance model best fits your company, and adapt accordingly. For more, see ‘The tribulations of worldwide websites’ on our website. Company values pages are home to some of the worst clichés on the corporate web. They can often seem an afterthought, rather than an opportunity to showcase what is unique about a company’s culture and turn it into a selling point. In the spirit of ‘showing’, Jason Sumner shares a few examples, good and bad. ‘Show, don’t tell’ is a longstanding principle in creative writing. Authors, so the advice goes, should illuminate setting and character through action and dialogue, and avoid vague summarising or heavy-handed explanations directing readers how to feel about the story. The same principle applies to company ‘values’ on corporate websites. In fact, the problem with many of these pages can often be boiled down to ‘too much telling and not enough showing’. 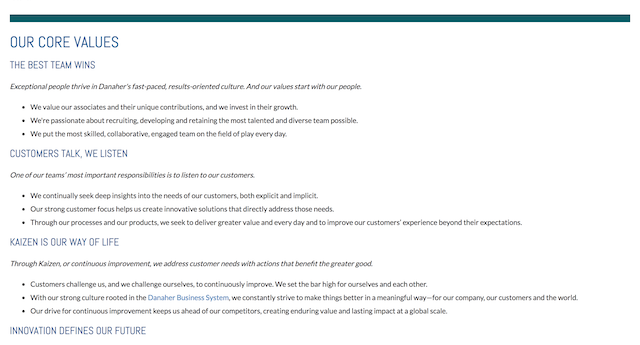 Danaher’s ‘Shared Purpose and Core Values’ page not only ‘tells’ the values of the US industrial healthcare conglomerate via well-worn corporate clichés; it puts them in a list of bullet points, a sure-fire killer of originality. The video at the top of the page could have worked well, but in Danaher’s case, it is just as vague as the rest of the page. The ‘Our Culture’ page on Irish pharmaceuticals group Shire’s corporate website does not use bullet points, but its approach, one dense paragraph, is equally dry. It includes statements such as: ‘Our patient and customer focused culture encourages employees to embrace innovation and challenge the status quo’; ‘honesty and transparency are inherent in all that we do’; ‘we foster an environment where leaders are positive, accountable, results driven and great people managers’, etc. These are all noble ideals, and Shire’s employees may well know many examples of how the company puts them into practice. Most visitors to the website, however, will need to take these statements on trust. At a time when institutions, and especially large corporations, are under scrutiny, it is risky to make statements without any evidence to back them up. In practice, digital teams may have some input on the company values, but little power to change them once they are agreed. That may even involve a directive from above to put them on the site ‘as written’, even if that means a bulleted list. Barclays, the UK financial services firm, manages to augment the conventional bullet points on its ‘Purpose and Values’ page with a number of relevant and carefully crafted videos, showing ‘values’ in action. The employee profiles are most effective, with members of staff explaining how they apply the values in their work and everyday lives. One drawback – the videos could be better signposted; they are at the bottom of the page in a tabbed menu, where they are more likely to be missed. French energy giant Total bolsters its values page, ‘Five strong values embedded in our DNA’, with embedded videos and links to resources around the site. For example, there is a short film about how an employee in Kenya rose through the ranks to illustrate Total’s ‘stand together’ team spirit. 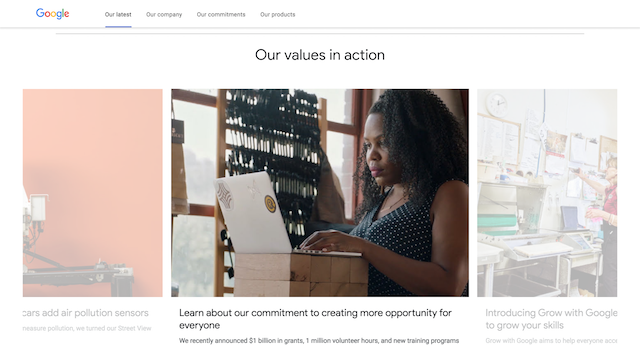 Google’s recently redesigned ‘corporate’ home page has an ‘Our values in action’ section, with a horizontally scrolling list of graphic-panel links to relevant stories housed across its sprawling web estate. For companies with a library of stories, it could be useful to think whether they illustrate the company’s values in any way and, if so, link to them from the relevant page. In the past 12 months, the fashion for short, repeating videos on corporate sites has gone from unusual to mainstream. Jason Sumner highlights the best uses of this still emerging feature, and points out some pitfalls to consider as the trend spreads. So-called looping videos – short, usually soundless clips that play automatically on web pages – have been a positive development for corporate sites. When done well, they are eye-catching, stylish and add visual interest; they help draw readers into accompanying magazine-style material; and, for the moment, signal that a company is innovative and in touch with modern web trends. Leading media sites such as the New York Times have been experimenting with video for some time to add impact to stories. It is encouraging to see that corporate website designers have by and large taken this thoughtful approach (with a few exceptions), as opposed to gimmicky, GIF clickbait that is so prevalent on Twitter. Over the last 12 months, we’ve been evaluating the best companies in the world at digital corporate communications for our latest Index of Online Excellence (scheduled to be released next week). We have seen the fashion for looping video take off during that time; so we thought it would be a good time to point out a few of the best examples so far, as well as highlight risks as the feature gains even more traction. Verizon, the US-based telecoms giant, uses a vertical carousel to automatically scroll visitors through a series of banners on its corporate home page, most of which use looping video. There are a variety of styles and subjects – covering responsibility, careers, innovation. My colleague David Bowen has pointed out before that the ‘moving eye’ video is one of the most interesting uses of the feature – literally ‘eye-catching’ (see below). On the whole, Verizon’s creative and actively edited approach is worth emulating. Estee Lauder Companies, the US cosmetics manufacturer, also uses looping video to good effect on its corporate home page, but the most unusual use of the feature is on its ‘Talent’ (careers) landing page. The banner is a grid of looping video clips, in monochrome, showing a diverse range of employees in mid-interview. A jobseeker already interested in working for Estee Lauder and landing here would likely find it hard not to click on at least one of the profiles. The Danish transport conglomerate’s looping videos fit seamlessly with the site’s polished visual style. Maersk limits the number of videos it uses, which makes them stand out more. When we checked the site this week, it was using looping video on the home page and only two of its six primary section landing pages – ‘Business’ and ‘About’. In the case of the landing pages, the theme is shipping and transport, a theme that lends itself to stunning imagery, as the Maersk site proves. The best looping videos use good practice principles for any type of visual – variety, originality, appropriateness to the rest of the site’s look and feel and sharp editing. The risks for looping video are the flip side of the above; and I would categorise the main ones at the moment as staleness and cliché. BASF and Facebook – when should a good video be changed? At some point even a great image goes stale, and the same goes for looping video. Some sites avoid the question by changing up their videos frequently, but for others perhaps with less budget and time, the question is harder to answer. BASF, for example, has had the same looping video on its home page for several weeks. It depicts a man (we assume an engineer) inspecting a server stack. There is a lot to like about it on first watch – it is brief and on point (the feature being promoted is about a super-computer), and unlike many other looping videos, it ‘ends’ with a close-up of the server lights flashing, rather than starting again. I happened to have returned frequently to BASF for my job in the last few weeks (reviewing the site for the Index), and I was thoroughly tired of it after a while. However, many, if not most, visitors to corporate sites are new and will not linger on the home page for long. So the balance is how much you will bore returning visitors versus impress the new ones. There is no right answer. Facebook is another example – it has had the same looping video (also featuring servers) on its sustainability microsite for more than a year, raising the question of whether it can or should be retired. It seems odd to talk about cliché for such a relatively young feature, but we have noted a few already (servers and wind turbines are on the borderline, for example), but a certain kind of Careers microsite video may already qualify. 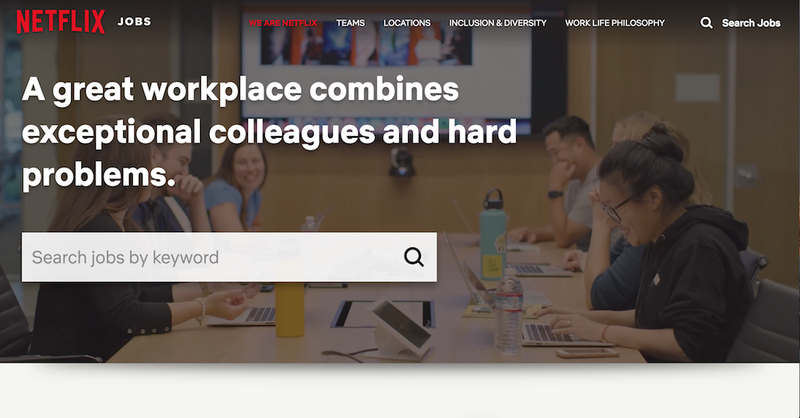 The Netflix careers microsite is one example (and probably not the worst) of a ‘type’ – wide shot of the workplace, followed by employees walking and talking; in meeting rooms; ‘collaborating’ next to walls, etc. These are beginning to look like they came from an agency cookie cutter. The conventional ‘corporate video’ is a fertile ground for visual clichés, so it is interesting that looping videos so far have avoided most egregious of these. That may reflect the attention being given currently to making them stand out. As they become easier and cheaper to produce and attention moves to the next new thing, then over-use and corporate clichés, as with more conventional types of imagery, will become bigger dangers not to be repeated. Why waste the media's time when you don't have to? An online press release archive should be a useful tool for journalists to do their jobs. So why are companies complicating things by separating press releases into different buckets that might be clear inside the company but make little sense to anyone else? Jason Sumner looks at a handful of the worst examples. There is a lot of confusion at the moment about what should go in media sections on corporate websites, which reflects wider doubts about the purpose of company press offices when anyone with a smartphone can be a ‘journalist’. My colleague David Bowen has written about this dilemma recently, concluding that press offices don’t know exactly what they are for any more, and so their online media sections don’t either; and suggests some sensible remedies. The confusion about online media sections could help explain a trend I’ve spotted on a few corporate sites recently: separating press releases into two or more categories, for reasons that may be clear internally, but do not make sense to anyone else. Three of the most puzzling examples are from French luxury goods maker LVMH, US-based Campbell Soup Company and Allianz, the Germany-based insurance giant. Both are separate pages within LVMH’s media section, and they are given equal billing on the section landing page. Having two areas to search is already potentially time-consuming and frustrating for journalists, even if they might eventually work out the difference between ‘news’ and ‘press releases’. But is there a difference? Not one that I could tell for sure. The latest items on the ‘News’ page yesterday were about LVMH being ranked the most attractive employer in France by LinkedIn; several stories about LVMH’s brands, Loewe, Benefit Cosmetics and Louis Vuitton, etc; and a partnership between LVMH and Central Saint Martins, a London art school. On the ‘Press releases’ page, there were releases about financial results, dividends and mergers, and the top story was about LVMH making a bid to take full control of its subsidiary Christian Dior. So maybe the distinction is about ‘financial news’ and the rest? Except that in ‘Press releases’ there was a story about LVMH launching a cultural centre in Paris, in a ceremony attended by the mayor of the city and the French president at the time, Francois Hollande. Two other ‘press releases’ were about the company launching an innovation award and a prize for young fashion designers. All of which seem appropriate for ‘News’. Perhaps the difference is about news about the wider group versus the brands? Or maybe LVMH sees ‘News’ as exciting and ‘Press releases’ about the boring stuff? Or maybe it is because of internal divisions within LVMH. Hard to tell for sure, and there might be a perfectly logical set of criteria, but why should journalists have to work this out? The point is that the distinction is unclear enough that journalists will need to spend time clicking on both pages, when one page (perhaps with a set of filters) would be easier. Further adding to journalists’ confusion, and potential frustration, is that the filters offered in each sub-section are different. Neither set is comprehensive, but journalists searching ‘News’ are given year and month filters, in addition to those for ‘All business groups’, LVMH and several of its business divisions such as ‘Fashion & Leather Goods’, etc. Journalists searching the ‘Press releases’ page only get year and month filters. 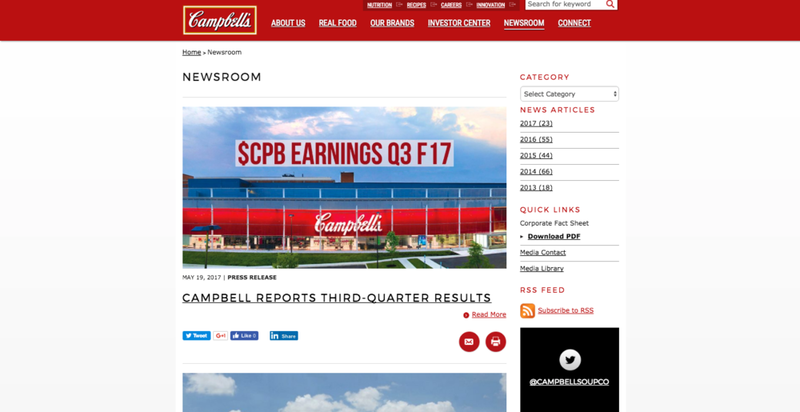 In Campbell’s ‘Newsroom’ section there are different pages for ‘Campbell News’ and ‘Press releases’, immediately confronting journalists with the same problem as on LVMH.com, where to click? While there appears to be some kind of internal logic in the LVMH example, the distinction between releases is even murkier on the Campbell’s site. When we looked, both ‘Newsroom’ and ‘Press releases’ led with the same release about the company’s third quarter results. The second release on each page appeared to be about the same story, the installation of a solar array at the company’s headquarters in Camden, New Jersey, each with a slightly different take. Then, further down, the release that appeared on ‘Press releases’ also turned up in ‘Newsroom’. Add to this the fact that the filters are different in each section, and the overall experience is baffling. Allianz has one page for ‘all’ press releases – although it is badly labelled ‘overview’ in the mega dropdown menu under ‘News’. So far, so much better than LVMH or Campbell’s. However, the subject filters to help narrow down the list are on separate pages – ‘company’, ‘studies’, ‘financials’, ‘commitment’ and ‘business’, each with separate links in the mega dropdown panel, and on the media landing page. Clicking on ‘financials', for example, leads to a page with the original list filtered for finance-related releases. If and when journalists figure out the unusual system, they will potentially still need to click in and out of five pages, if they are searching for more than one release. The above three are not the only examples. Caterpillar, the US-based farm equipment company, has ‘Caterpillar news’ and ‘Corporate press releases’. Another company divides theirs between ‘group’ and ‘trade’. All of the above online press release services could be improved by thinking about how journalists actually access press releases from a website – or speaking to them to find out. In our experience, the best services are simple but highly useful – well-labelled, well-signposted, deep, searchable archives (with keyword search and relevant filters). Coming to that conclusion is probably the easy part. The difficulty comes in overcoming the internal politics – governance, in our terms – that are likely to have led to the separate buckets in the first place. Our new free report, based on several years of advising large companies on their digital communications measurement, has advice and best practice on analytics, visitor surveys, strategy, and more, says Jason Sumner. Measurement is routinely cited as a top priority and challenge in Bowen Craggs's annual ‘Digital Manager’s Agenda’ surveys. In 2015 it tied with customers as the number one concern and in 2014 it was number two. A separate Bowen Craggs survey in 2014 showed that only one in three respondents had identified key performance indicators (KPIs) and routinely reported against them. Over the years, through the research we conduct and the advice we give corporate digital teams, we’ve established a framework for measuring online communications – one that evaluates how well all of your company’s online channels are serving business goals and audience needs. Measuring what matters in digital corporate communications gives practical advice on implementing the framework. It also presents the key points from our ongoing Google Analytics benchmark research, best practice in creating visitor surveys and a case study on the ‘Insight Hubs’ at pharmaceutical giant GSK. Survey data on ‘visit reason’ (why people come to your site) is especially useful when broken down by visitor type: For example, our research shows that one of the main reasons investors visit corporate sites is to find out about the company. They do not only visit to find financial information, which demonstrates the importance of website structure, signposting and easy navigation between website sections, something the methodology for the Bowen Craggs Index of Online Excellence has always emphasised. Visitors who do not achieve their goals on corporate websites often leave with a lower opinion of the company: For example, in our visitor surveys 19 per cent of respondents who did not achieve their goals leave with a worse perception of the company, compared with only 7 per cent of all visitors. Although there is considerable variation in goal achievement between companies we advise, the correlation between goal failure and a worsening opinion of the company is universal, and therefore statistically significant. Insight Hubs at GSK: ‘Insight Hubs’ are monthly, two-hour in-person meetings with the central GSK digital communications team and additional ‘content owners’ (about 10 people in total). A wider group of people, each of which are responsible for a section of the corporate website (Investors, Careers, Media, Research, etc) or a piece of content, receive the ‘Insight dashboard email’, which comes out of the meetings. The Insight Hubs sit alongside a wider and longer-term ‘strategic’ review of the website and other online channels. Social media and traffic acquisition: Our Analytics benchmark (which collects the Google Analytics data for 27 major corporate websites) suggests that social media is driving very little traffic to corporate websites overall, but that there are isolated examples of success (one company in the benchmark acquired almost 4 per cent of visits from Facebook). Sponsorship plays a role in this. Facebook and Twitter make it difficult for users to leave their platform - these platforms restrict distribution to a small part of a company’s audience, unless the link is sponsored. Timing and subject matter are also important. One of our clients’ tweets were 100 times more successful in driving traffic than normal when they were tied to an external, live event. However, not every tweet is about driving traffic to the corporate website; it could be about getting retweets, gaining more followers, driving visitors to a blog post. You'll find much more in the full report.